In early November APC by Schneider Electric introduced second-generation power modules for the Symmetra PX 100kW UPS line, enabling them to join the ranks of other Energy Star qualified UPSs that we’ve unveiled over the past few months. According to ASHRAE Advanced Energy Design Guides, hospitals account for less than 2% of the floor space and almost 6% of the energy consumed in the U.S. The average large hospital consumes 234 kBtus/sq ft according to the U.S. Energy Information Association. So what does that mean to an electrical engineer? It means that whatever energy saving measures we implement could be two to three times as effective as they would be in a conventional building—just due to the size of the loads. Upgrading a hospital’s UPS system with a modern centralized UPS is one way to save money and energy. Hospitals constantly upgrade technologies and house cutting-edge technologies that require premium UPSs and/or power conditioners. Unfortunately, many hospitals are plagued with a hodge-podge of UPSs of varying sizes and efficiencies. Typically, they are deployed in a point-of-use manner for individual loads during each expansion, project, or initiative within the constantly evolving building infrastructure. This distributed approach leads to many oversized UPSs that function in the lower range of their efficiency curves. Typically, these UPSs are from various manufacturers with inconsistent features and labeling. In general, they are maintenance headaches and big energy consumers. I couldn’t have said it better myself. The article goes on to explain how hospitals can benefit from replacing multiple older UPSs that have relatively low efficiency ratings with a single, modular UPS. And that’s not just in the data center, but also in areas such as the diagnostic imaging unit, for MRI and CT scan machines and the like. The author does a nice job outlining the various opportunities for savings in energy costs, which amount to tens of thousands of dollars per year. While the story does make mention of using newer, more energy efficient UPS models, it does not specifically mention Energy Star UPSs. 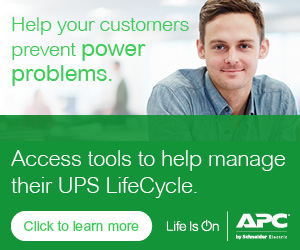 But to earn the Energy Star label, a UPS must be in the top 25% of the market in terms of operational efficiency. To determine whether it meets that criteria the UPS has to be tested according to EPA’s test procedures, under the supervision of an independent certification body – which in Schneider Electric’s case is UL. The tests include efficiency ratings at loads of 25%, 50%, 75% and 100% and the results are published on the EPA’s web site. Testing under a range of loads is important because it’s relatively easy to deliver high efficiency with a full load, but much more difficult at light loads. A UPS that’s, say, 5 years old or more can achieve an efficiency rating of probably no more than 91% when it is 85% loaded or more. If you back off to 30% to 50% load, which is a typical level for many UPS systems, the efficiency drops to probably below 80%. Our new Symmetra PX 100 UPSs, by contrast, are approximately 95% efficient across a wide range of loads, from 35% on up. Think about the difference between 95% efficiency and 80% and you would expect the savings in electricity to be significant. And they are. For every 1% gain in efficiency you get in a 100kW UPS, you can expect about $1000 in electricity savings per year, assuming you’re paying 12 cents per kilowatt hour (a typical rate in the Northeast). What’s more, as the article correctly points out, in a hospital environment there is a fair amount of UPS-protected equipment, such as those MRI and CT scan machines, which is not used much during the night. That means the UPS may be under far less load at night than it is during the day; it’s important that its efficiency rating not suffer. At the same time, better UPS efficiency also means you’ll spend less on cooling. For example, the next-generation Symmetra PX 100kW (a 95% efficient UPS) produces 37% less heat than the previous generation (a 92% efficient UPS). What’s more, choosing an Energy Star UPS may make it easier for you to qualify for rebates and incentives offered by your local utility as well as assist in achieving LEED certification, which is a major part of a healthcare institution’s drive towards green buildings and facilities. Learn more about our various Energy Star compliant UPS systems, including the Symmetra PX, Back-UPS and Smart-UPS – and start saving.